The new incarnation of the 650 sports the same design as the recently released Treo 750v, but tweaked a little to suit the Palm OS better. While the 750v has a pair of soft-menu keys for Windows Mobile, on the 680 they've become the call make and break buttons. What on the 750v are the call keys and the Windows Mobile Start menu and OK buttons are here four application keys: Phone, Calendar, Messaging and Home - the latter taking you to the OS' apps menu. The 680's application keys are larger and more angular than the 650's were, and the older model's menu key has been repositioned to replace the right-hand Shift button. The move means there's an extra application key now, but it's less conveniently placed. Like the 650, the 680's infra-red port is on the top of the device next to the speaker deactivation switch. On the left-hand side are the volume controls and a key that, if held, launches the voice recording app - a tool missing from the 650 - though like the application keys on the front of the 680, it can be redefined to run different things. The right-hand side of the phone has a large flap under which is the 680's SD card slot, which not only supports MMC media and SD IO devices but also SDHC cards. Certainly, the 680 I tried had no trouble reading the 4GB SanDisk SDHC card I used with it. SDHC support isn't listed in Palm's Treo 680 tech specs, but it worked for me. The 680's SIM slot is now inside the battery compartment rather than the top of the handset: there's a slide-out tray for the card rather than the recess used in many mobile phones and the 750v. 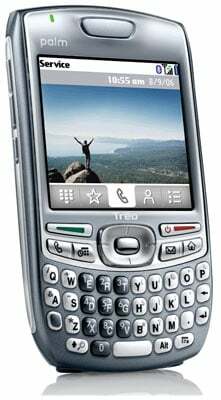 Like the Vodafone-branded Treo, the 680 ships with a removable 1,200mAh battery.